It’s a new fashion season with a fresh perspective, new color palette and a potpourri of trends to choose from. For some of us it’s not here a minute too soon as we grow tired of our summer selections. For others a bit of clothing confusion crops up when we start to think about what pieces to add and what trends to adopt. I wish there was a simple answer. Naturally there is a lot to choose from because the fashion industry wants to make sure there is something for everyone. And there is. That said, what’s right for y-o-u really boils down to three things. What would add variety and visual interest to what you already own? Many of us already have the requisite pair of great-fitting black pants, a dress up/dress down pair of dark wash jeans, a trench that transitions the seasons and so on. But when you move beyond the basics, what are the items that will perk up your existing pieces? Think about pattern, texture, shine and embellishment. What is the trend that will give you the most use-value during the season? I am in love with all of the metallic booties. But I have asked myself: How often am I really going to reach for them instead of black? And…Are they really worth the expense and the real estate in my closet? So I’m going to encourage you, as I do all my clients, to think about fashion and function. I’ll touch on a few different trends in the coming months but for now I’ll start with pattern – specifically gray plaid. A perennial favorite for sure, this season fashion has rediscovered it. And so have I. Here are a few fab finds. 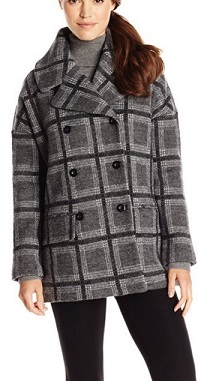 From work week to weekend, this jacket offers a more contemporary take on a traditional plaid. It’s the perfect companion to your slim pants or jeans – and your weekend enjoyment. What’s more the double breasted pea coat styling is also right in step for the season. This pick is available on Amazon AND is Prime friendly. Who could ask for more? Joie jacket available online at Amazon. Look at what cropped up. Think you have to give up your shorter pants for fall? Think again. I love this plaid cropped pant with a bootie and your favorite slouchy knit. The wider leg is extremely flattering, balancing out the hipline, and the elastic waist means that they’re comfortable enough for any 12-hour day. And the fabrication? Let’s just say this wool flannel ups the cozy factor and is one of the many reasons we wait with bated breath for fall fashion. Eileen Fisher pants available online at Nordstrom. No need to add a jacket to this baby. This borrowed from the boys, menswear-inspired glen plaid has both visual authority and great style. 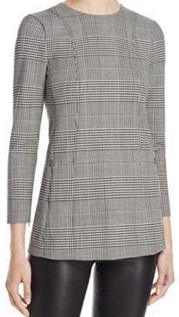 The zip pockets, cuffs and back add a bit of modernity to this tailored top. Pair it with a colored pant (or shoe) to add a bit more whimsy to this office-ready piece. Theory top available at Bloomingdales. An accessory is just the ticket when just a dab of plaid will do you. This loafer not only adds visual interest but is also a welcome departure from all of the basic black footwear most of us own. Dual tassels and brogue trim heighten the menswear look and feel, while the pointy-toe front keeps it modern. And let’s not forget that your feet will thank you for a flat heel. Franco Sarto shoes available at Nordstrom. I do love a dress that seamlessly goes from desk to dinner (with a change of accessories, of course). Think of this one as the intersection of tailored and trendy as lace embroidery embellishes this tailored cap-sleeve dress plaid sheath. 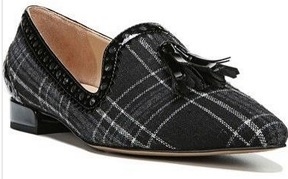 And let’s face it – it’s hard not to love this juxtaposition of “lady-like” lace and “borrowed from the boys” plaid. Betsy Johnson dress available at Nordstrom. Not as mad for plaid as I am? Few people are (smile). But you can still be right in step this season with a touch of trend. 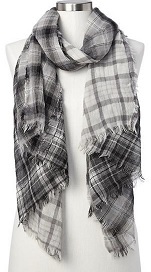 A plaid scarf marries fashion and utility. This one is a wool and cotton mix which means that that you’ll reach for it sooner than later and more often than you think. It will help you take items like your favorite white T and denim jacket into fall – not to mention that the neutral palette will work back to every coat you own. And let’s not forget – it’s the perfect travel companion! Get the Gap scarf. Carol Davidson is style strategist, life coach and fellow Tomato. She helps people better manage their lives, create fulfillment and develop a plan to love their look and their life. 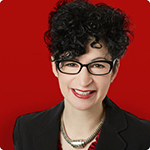 Her expertise has helped hundreds tackle their careers and personal lives with confidence and enthusiasm. To learn more about her wardrobe and life coaching services and how you can work with her virtually or in person, please reach out to her at Carol@CarolDavidson.com. 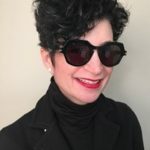 For more shopping picks and lifestyle tips, please visit Carol on FB: Carol Davidson Life Style Strategy and follow her on Twitter @CarolDavidson. Thanks for all the great practical tips – easy to use right away and affordable, too. I love the Gap scarf. Sometimes that’s all it takes to update a look. And, as you say, very packable whether in a duffle, back pack or purse, to add a layer when it gets a bit chilly.